Premier Dr D Orlando Smith at a press conference in the Asheley Ritter building on Tortola. Public servants are being told that they have nothing to fear as it relates to job security. That assurance came directly from the man at the helm of Government, Premier and Minister of Finance, Dr D Orlando Smith. “Yes. I can say there will be no layoffs in the public service,” Dr Smith said during a press conference this afternoon. 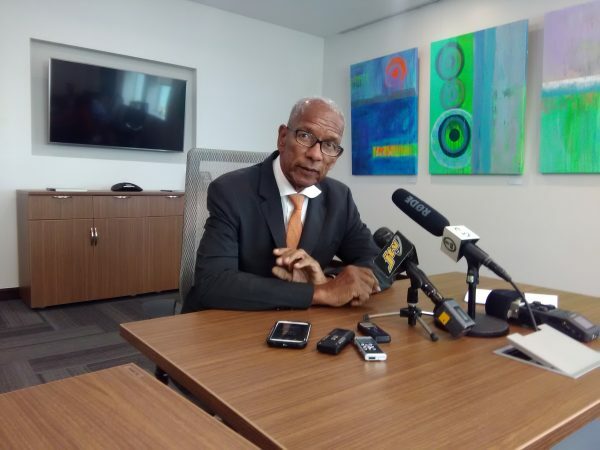 “We haven’t had any discussions with the public service about cutting staff or cutting salaries,” added Dr Smith while answering questions from journalists. The Premier made the statement amid widespread speculation that government does not have enough money to continue to pay all its workers. Fear of layoffs were heightened after government was considerably late in making payroll on more than one occasion recently. Several residents in the private sector lost their jobs after hurricanes Irma and Maria laid waste to numerous businesses, homes, and other properties in the British Virgin Islands.